On Friday, June 3rd 2016, I found myself in the back of Ben’s SUV, turning off the Trans Canada Highway just past Golden at the Donald weigh station, onto the now familiar road leading to Kinbasket Lake and eventually the Bush and Sullivan River forestry service roads. Our destination this time was the very end of the Bush River FSR followed by a trek into the bivy site for Mount King Edward. Of course, our original intent was to also climb King Edward, but for a variety of reasons this didn’t happen as I’ll detail a bit later in the account. 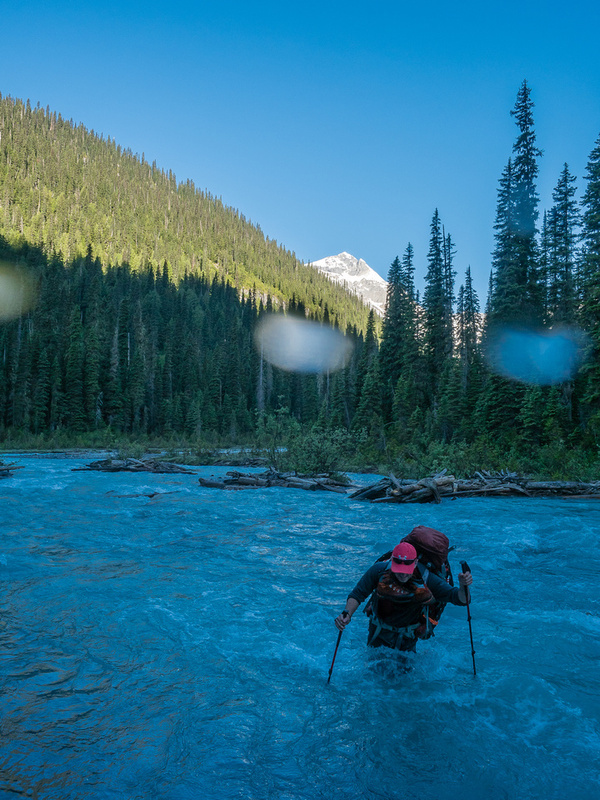 The weekend was a fantastic backpacking trip with river crossings, bushwhacking, snowshoeing, sleeping on snow and incredible views of huge peaks including the incredible west face of Mount Columbia and north face of Mount Bryce. I think that deserves a trip report even if it didn’t result in a ‘real’ summit. The last bridge over the Bush River, just before the South Spring Rice Brook spur leading up to the Bryce and Alexandra trail heads is starting to wear on the east end. The last 1-2 feet of decking is rotting and the road abutting that end of the bridge is eroding. This could become a very large issue for accessing four of the 11,000ers, namely Bryce main and center, Alexandra and King Edward. The road after the last bridge over the Bush River is narrower and rougher than before the bridge. Don’t be tempted to drive up any spurs – stay left at any junctions sticking closer to the Bush River. 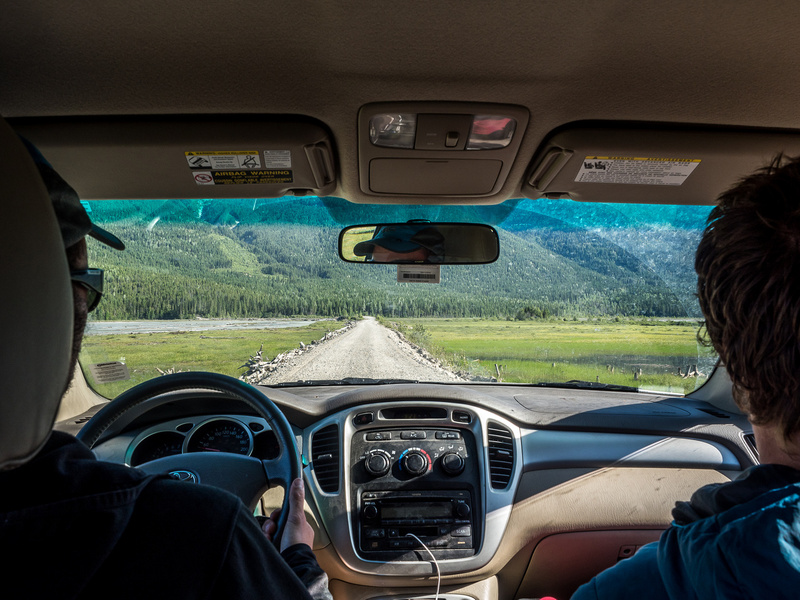 Driving the Bush River Road can be interesting. Our plan was to cross Bryce Creek where the bridge is out by a Tyrolean traverse, using the cable attached to a stump on the other side of the creek (which was the way I crossed the creek last year and it worked well). We tried pulling the cable(using the winch hook on my SUV), however, it was wedged under a rock close to the other side of the creek and we couldn’t get the cable out of the water. We followed a snowmobile path about 30m downstream of the truck where the crossing looked reasonable. On approach the water didn’t come much past our knees at 10:00 in the morning of a cloudy day (rain the day before). We were pleasantly surprised by the ease of the crossing but I wasn’t going to let that stop me from being cautious on return. I knew that given 2 days of nuclear conditions and no solid overnight freeze, this creek could be quite a different beast on Sunday than on Friday! Despite my best intentions, we also forgot to bring the chainsaw across with us in case of a raging torrent on return. We would now not be able to easily build a makeshift bridge… Hopefully that mistake wouldn’t cost us later. Exiting the creek near the start of the King Edward approach. 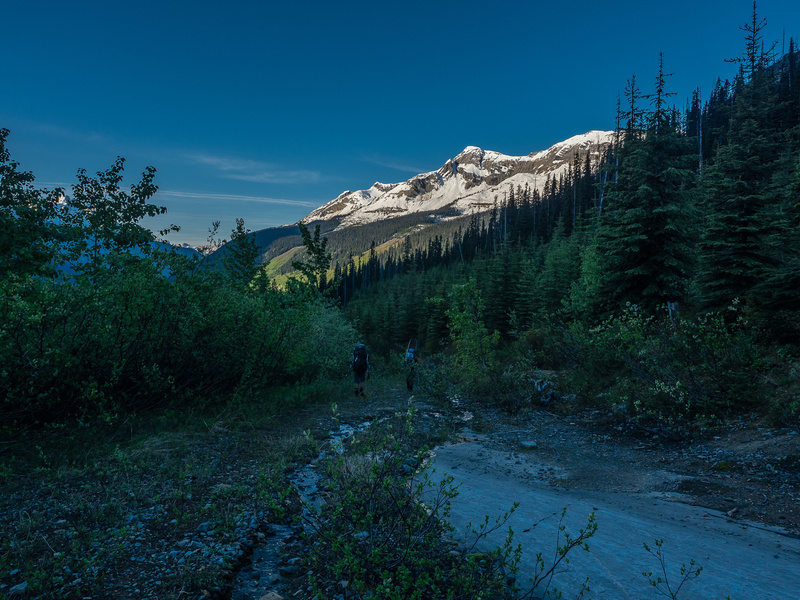 The logging road was initially very easy to follow as it switch-backed up the nose of the ‘handrail’ ridge that leads all the way to the alpine beneath the western end of the Columbia Icefield. The basic navigation to the bivy is actually very simple. 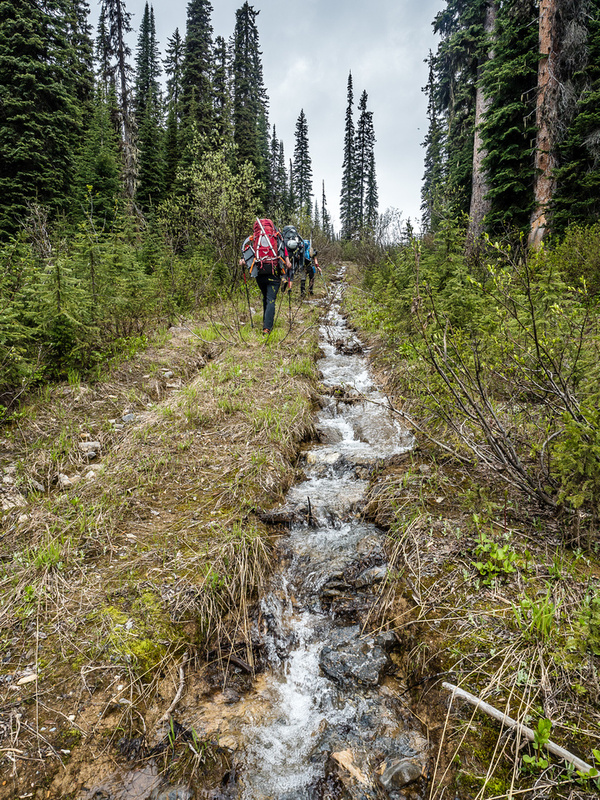 Once up the nose of the ridge, follow the road and navigate a marked trail through the forest after the road ends. After a few easy kilometers which had us gain a lot of height and lose a lot of sweat, the road started to deteriorate. 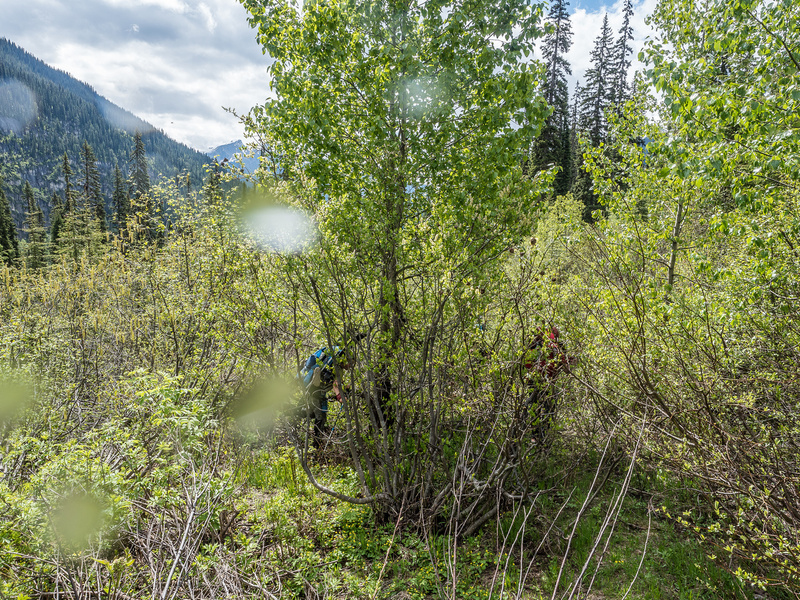 It was still very easy for BC bushwhacking, but not necessarily what you’d expect on a “road” either. 😉 There was a rushing stream that left its own comfortable ditch for some reason and decided to run down the middle of the road instead. Then there was a delightful patch of alders that decided to use the road as their own personal back yard. A few bits of gear were sacrificed to the alder gods before we got through the far side of that section! Josh had the most fun of any of us, thanks to a split board strapped on his pack. No regrets there! The approach road is overgrown and rough, including a stream that runs across and down it. 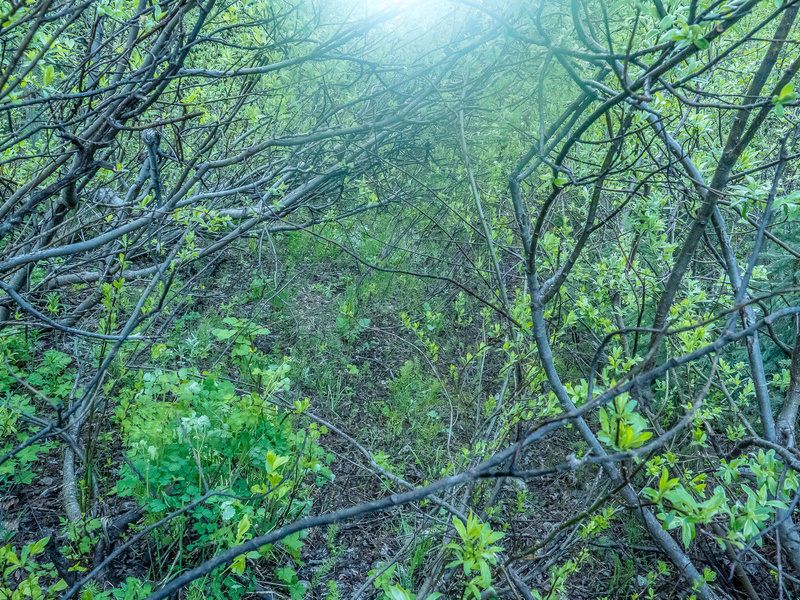 It was along the first (old, overgrown) clear-cut that we started to get a bit confused on ascent. We were looking for the so-called “ATV track” that Corbett mentions, and also looking for blue tape. We knew that the book description was old, but I had forgotten to read the new one (I had a preview copy that I was proofing for Bill) and so that’s all we had to go on. The new book is more accurate. 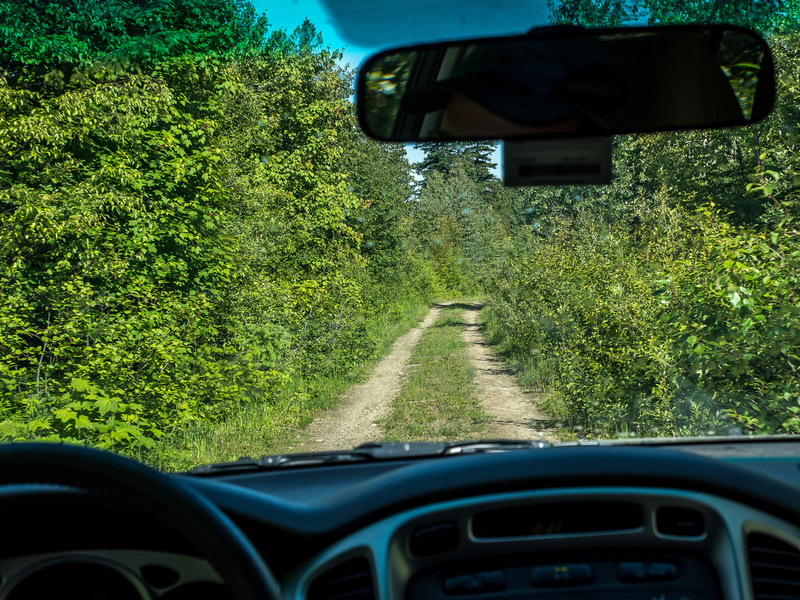 Instead of looking for ribbons, the trick is to continue on the road, past the first clear-cut as it takes a sharp turn uphill left and then straightens again to the right, continuing north. Soon you enter the second clear-cut and encounter a small rock wall to the right of the road which is pretty much disappeared at this point. Immediately opposite this wall we had a small stream coming down the clear-cut, muddying things nicely. After diving into the shrubs there are some orange ribbons that mark a very old track rising left to the NW upper corner of the cut. On ascent we missed this track and went to the far end of the cut before bushwhacking uphill to the NW corner directly – there’s a faint trail here too, so we’re not the first to do it. There’s an old board nailed to a tree just inside the cut near the top of the NW corner. Following along a small stream into the forest soon resulted in finding orange ribbons and cut logs, signaling a trail of some sort. From here to the alpine we followed a pretty obvious line of orange ribbons that angled up reasonable terrain in a slight right to left rising traverse under the ridge above. A few times on approach we were tempted to head up the ridge directly, but this would have been a horrible idea on hindsight. 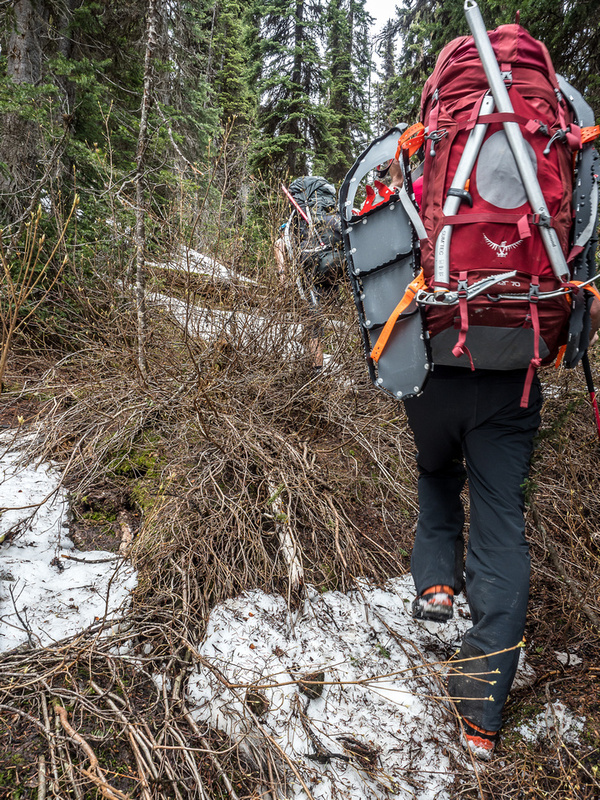 We were quite surprised to run into continuous snow at around the 1650m contour line while still in the forest and strapped the snowshoes on from here to the bivy. The snow was extremely supportive at this point and we were delighted to hike easily on top of it. One thing we did not like, however, was the cloud cover. We were depending on a sunny day to set off avalanches / cornice failures the day before our climb and this wasn’t happening. Near treeline we lost the ribbon highway but it didn’t matter at this point. Even with clouds, we could see where we wanted to go and kept in a rising traverse left, eventually getting into beautiful rolling terrain that must look sublime in the summer and fall with vegetation. It was nice with snow too, but I found myself wanted to revisit this area, even if we managed to summit King Edward on the first try. We followed the rolling terrain until spotting a small melting tarn with a nice dry rock ledge nearby that we could dry gear and lounge on. The snow cover was amazing, considering how dry the Forbes area was a month ago already at higher elevation! The west side of the divide sure does get a TON more snow than the dry Alberta side. Incredible views of Mount Columbia from our first attempt at Mount King Edward. We set up a nice camp at the tarn and enjoyed a leisure supper with the view slowly opening up. 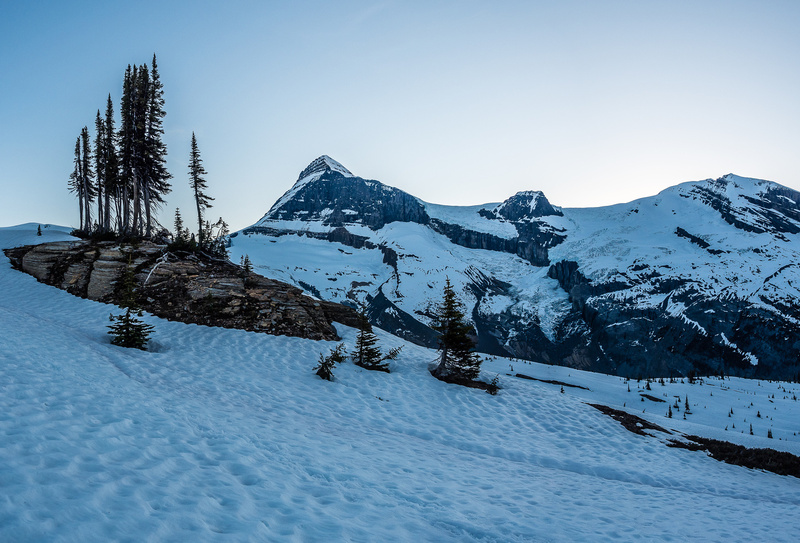 There was enough blue sky starting to show up that we decided to go to bed early and try to get up around 02:00 for an attempt at King Eddy – hopefully under a clear, cold sky with firm snow. Alas, this didn’t happen. Thick cloud cover at 02:00 and a very slushy snow pack drove us back to our tents. Mike and I woke up around 05:45 for some sunrise shots – the clouds were finally dissipating but it was now very warm and far too late to make an attempt. After some discussion about whether to head back already before the river could rise too much, we decided to wait another day and hopefully get an attempt very early on Sunday before hiking out to the truck. 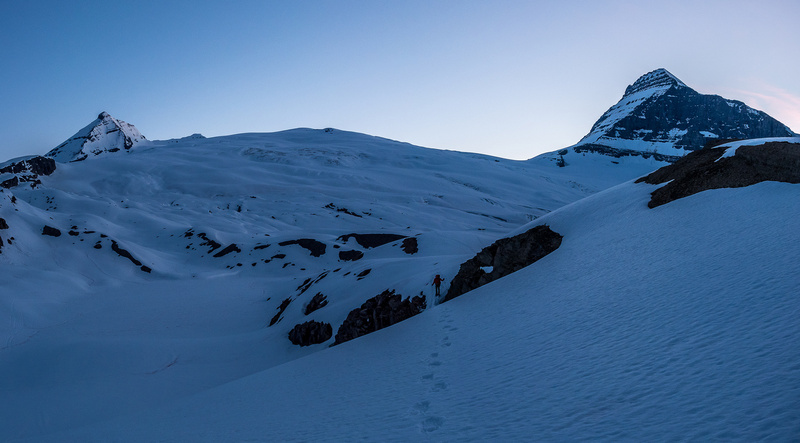 We were left with an entire day with nothing to do, so Ben, Mike and I decided to head off to Toronto Peak, 8.5km (one way) from camp across the west Columbia Icefield. Josh decided to hang back and do some “telemark split board skiing” – don’t ask, but it looked fun. We worked our way further left as Ben remembered the right (east) side of the glacier being quite crevassed. 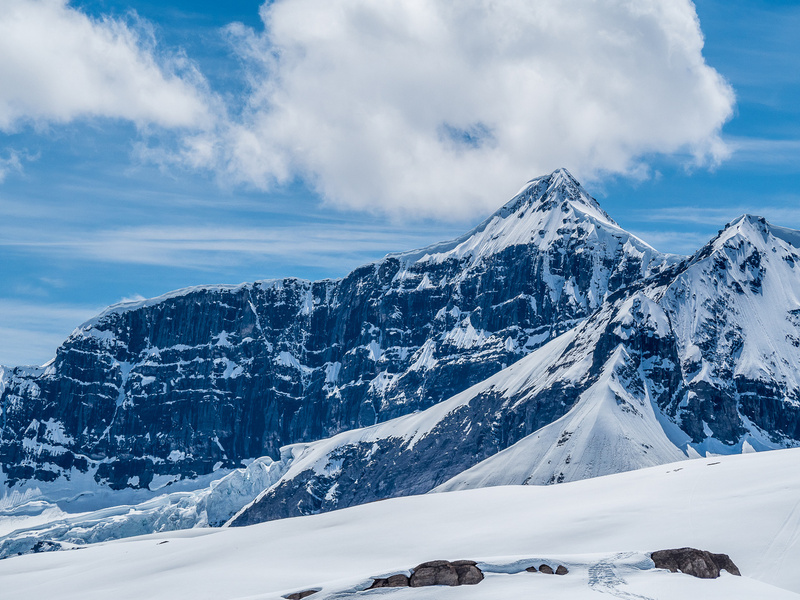 This worked great and within an hour from camp we were looking across the icefield at King Edward and Toronto Peak – which looked very far away. 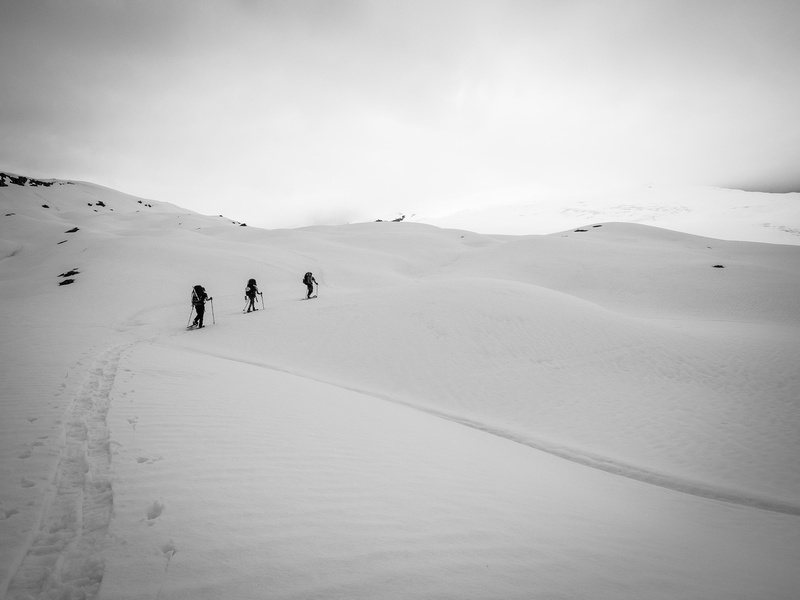 The snow was already slushy at this point and we could see a lot of crevasses on our route. 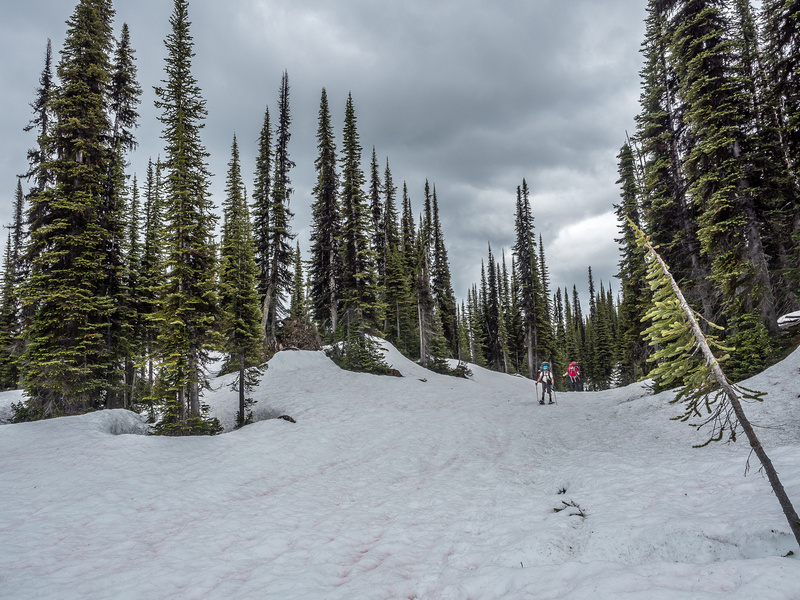 Mike and I weren’t feeling it – I knew if I did a 17km day on crappy snow I wouldn’t have good energy for a King Edward attempt the following day so we called it and ascended a nice viewpoint immediately east of the col we were at instead. The views from this lookout were amazing! The sky was clearing nicely and we had our first great view of King Edward, Columbia, Bryce, Cockscomb and the Chess Group to the west. We spent an hour in the warm morning sun, chatting and laughing about various topics and generally enjoying our incredible vistas. 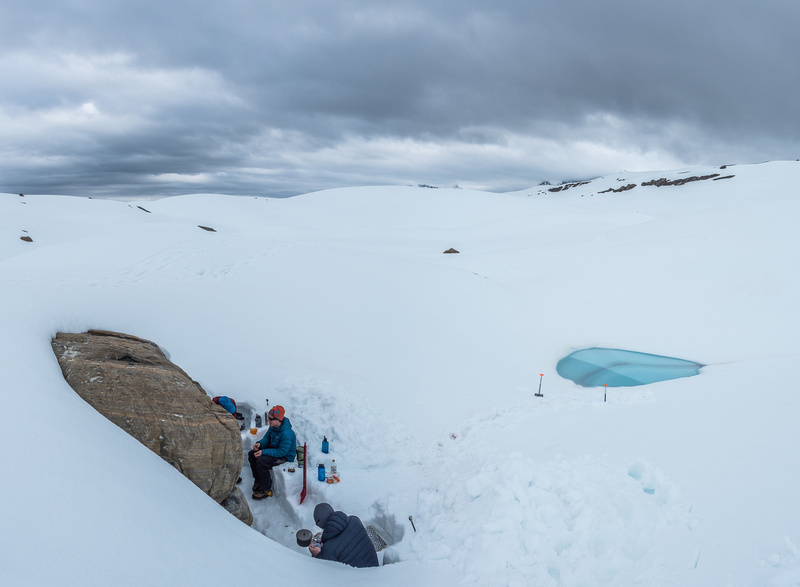 Looking back over our delightful snowy camp on our first Spring attempt at Mount King Edward. The rest of the day was spent doing absolutely nothing. We wandered about camp, slept and dozed on warm rock outcrops and enjoyed cups of coffee, schnapps and various other delights while enjoying the amazing area, which we had all to ourselves. 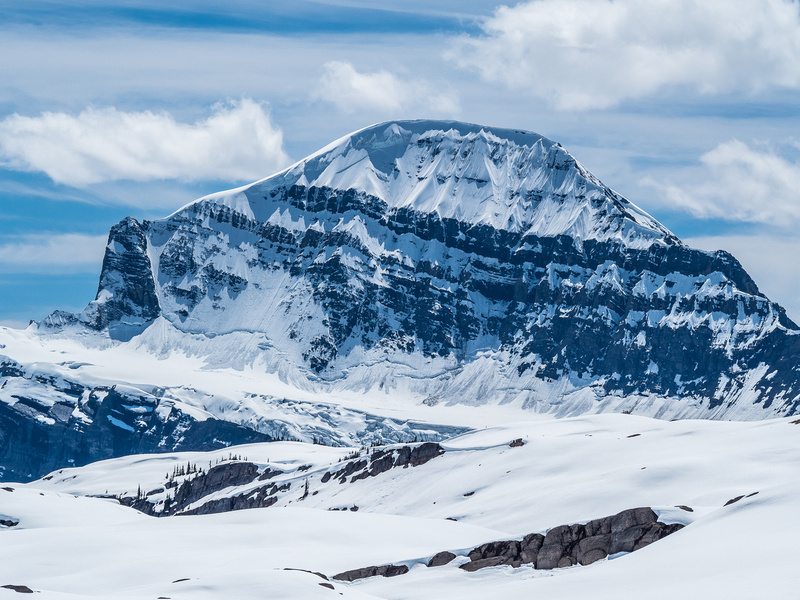 Ben pointed out the route that he and his group used on their Great Divide Traverse to gain the main Columbia Icefield from the west. 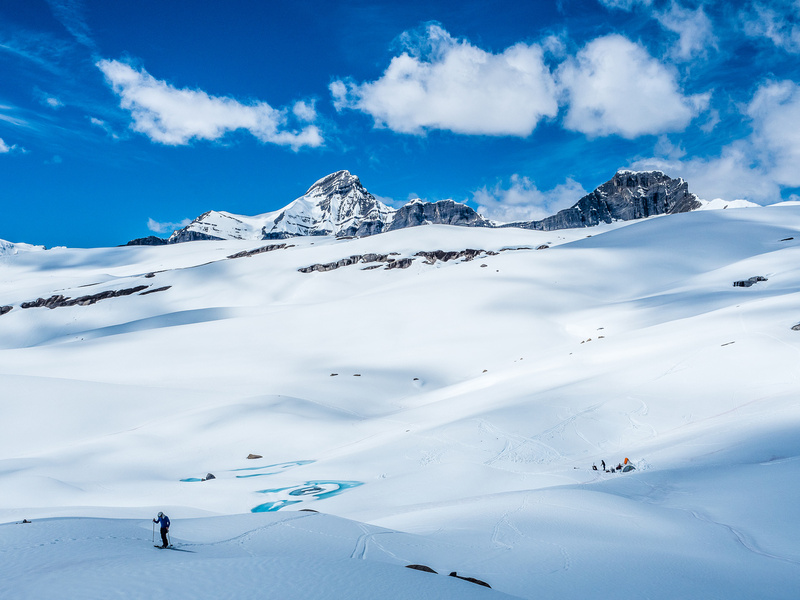 I was amazed that a group of snowmobilers managed to find a route up this side – we saw them on our Mount Columbia climb! I still don’t know where they went. I can see why it took them years to find a route up there though – it’s gnarly enough on foot. Sunrise from the King Edward bivy. Once again, when we got up at midnight the snow was slushy and very soft. The sky was clear and the snow would harden eventually, but the question was, how long would we have to wait and how long would the snow remain hardened? The east face would obviously get sun right at sunrise and would soften very quickly in it. Reluctantly we turned back into the tents for another 3 hours of sleep. At 03:00 we got up and slowly made breakfast and packed up camp. 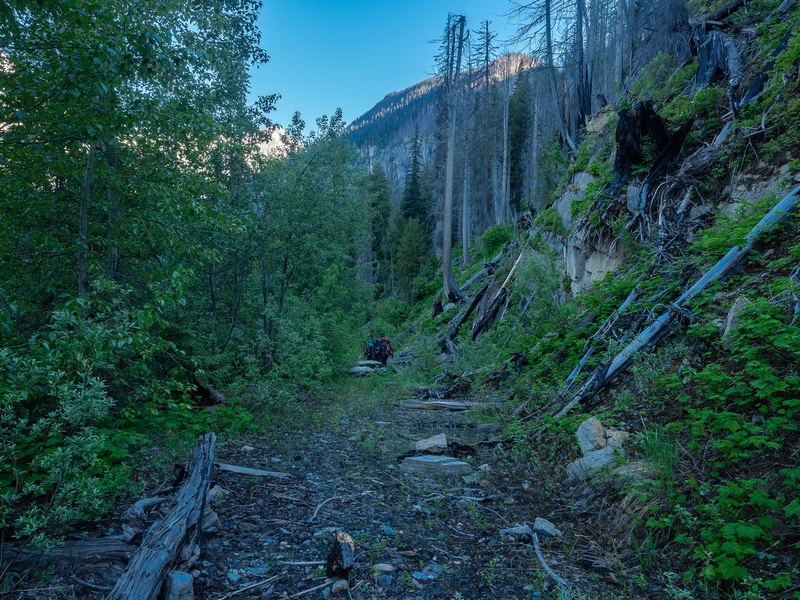 By 05:00 we were plodding down the alpine meadows to treeline. We enjoyed a nice sunrise on King Edward’s east face before plunging back into the forest leading to the logging road below. We had no further issues to the river, which was visibly higher and certainly flowing faster than on approach, even though it was only 09:00! Descending the cut-block in early morning. 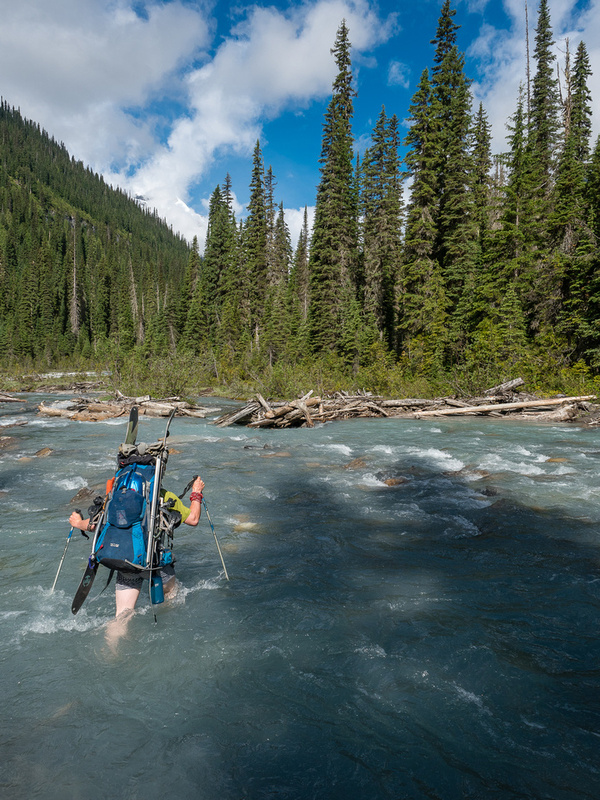 Mike exits a very feisty creek – note how deep he is! 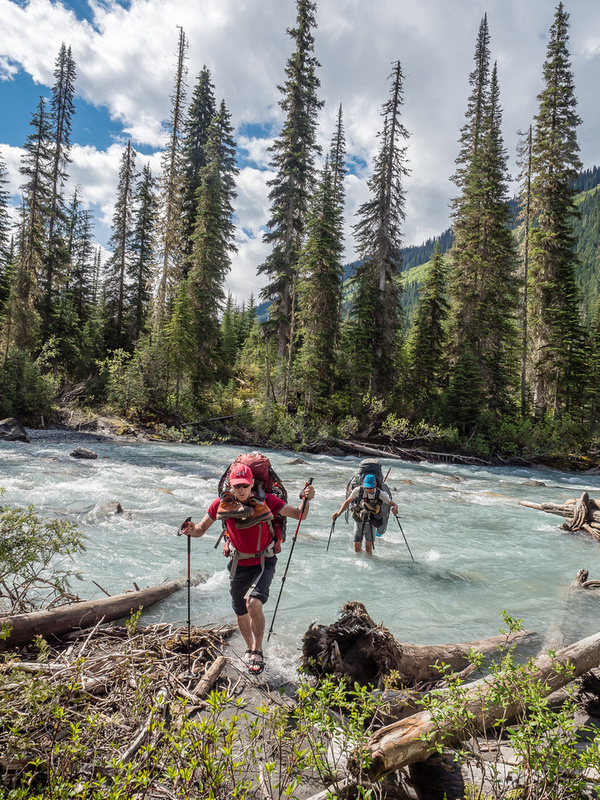 Ben and Josh simply crashed right through the river with all their hiking gear on! Mike and I were slightly more civilized than that but eventually we were also in the fast-flowing water. The crossing wasn’t too bad, but right near the shore it was just over crotch deep with a strong current. Any faster or deeper would have started to get interesting. I can imagine that at 15:00 this crossing would have been sketchy at best. With a full day ahead of us, Ben asked if we minded exploring the Sullivan FSR. This is the bridge at the start of the Sullivan arm of the Bush River network of roads. The Bush River is entering Kinbasket Lake here from the right. 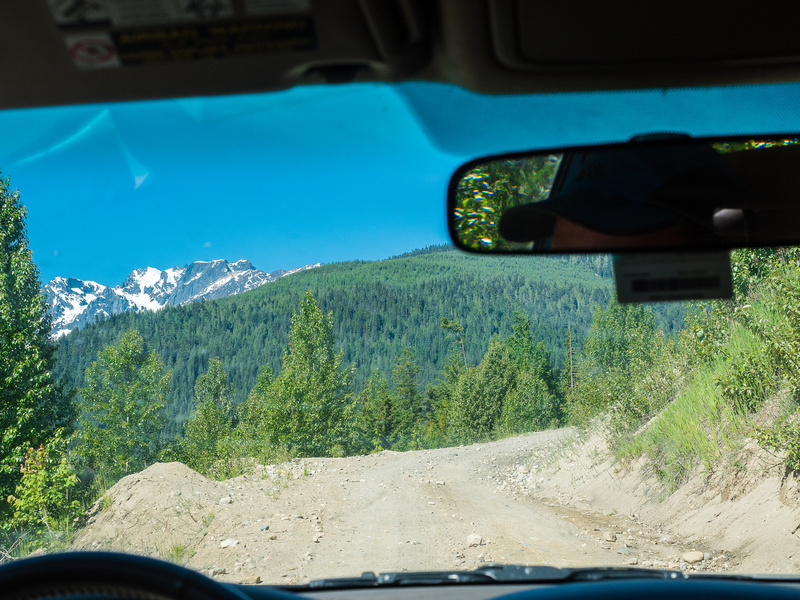 We agreed and spent the next 2 or more hours driving logging roads and scouting to the end of the Sullivan FSR where folks park for the Clemenceau heli-approach staging area. We even followed a rough track down to the Kinbasket Reservoir where we brewed up some coffee and enjoyed the beautiful warm and still morning. After this nice break it was time for a 5 hour trip back to Calgary which went smoothly in the 30 degree heat. Mike and Ben step out of the river crossing - it was much faster and deeper on return. 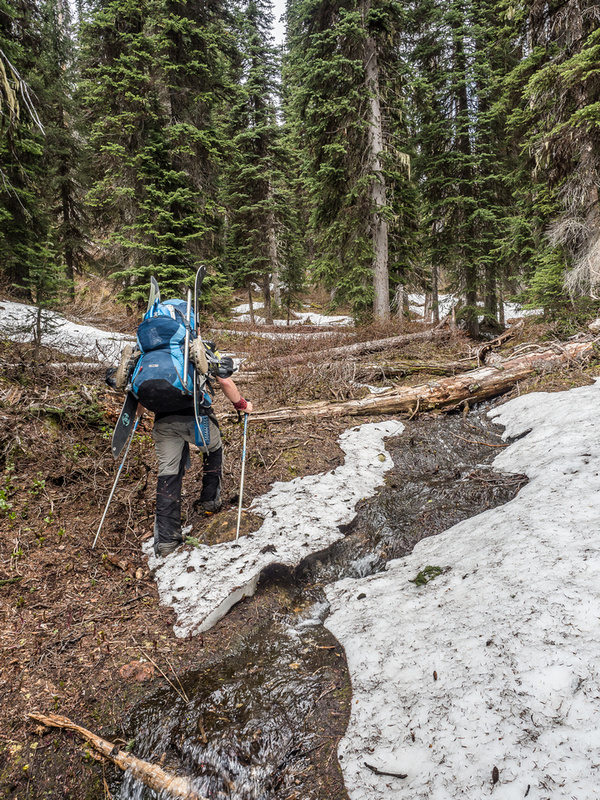 A hot trudge up the lower logging road as it switchbacks up the end of the 'handrail' ridge. Yes. This is the road. LOL. For some reason the stream decided to utilize the road here. We started running into snow almost immediately in the trees. Thanks to the snow cover we did get off trail a few times. Breaking out of the forest and traversing very interesting gully features to the alpine. Our delightful kitchen and small tarn. Sunrise from camp on Saturday. Mount Columbia at left, Bryce at center and the Chess Group at right. The sky is clearing fast as Ben leads towards GR660745 (c). Our elusive prize! 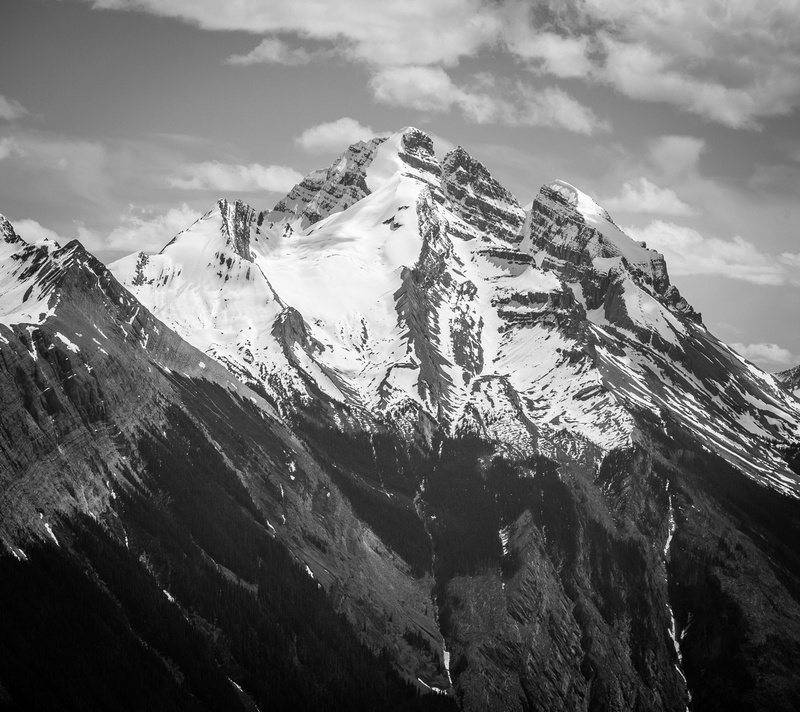 Mount King Edward looks spectacular from GR660745's summit. Believe it or not, this face has been skied! 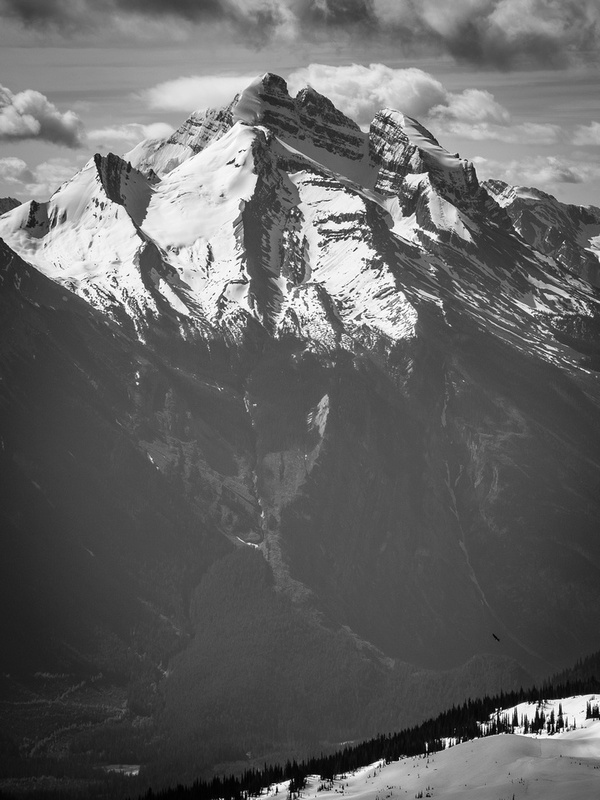 In May of 2012 Chris Brazeau became the first person to solo down it on snow sticks. 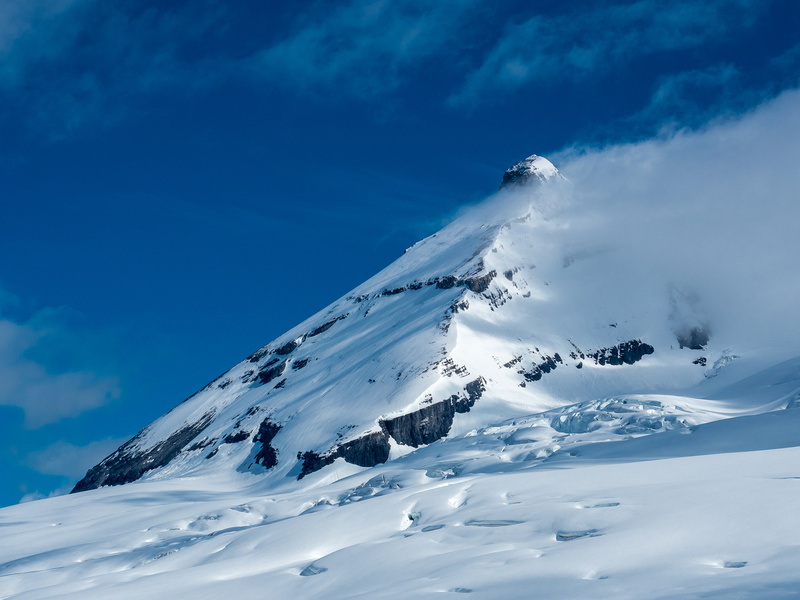 A unique view of the area around Mount Columbia (l), including her west face, west access glacier (c) and Mount Bryce (r). An eagle soars in the valley beneath the incredible hulking mass of Cockscomb Mountain. I can't get enough of the gorgeous Mount Columbia. Josh skis up to my vantage point with our camp below. Looking back at Mike exiting from the alpine meadows with King Edward at left and Columbia at right. Looking past a small island of trees towards Mount Columbia from near treeline in the alpine meadows. 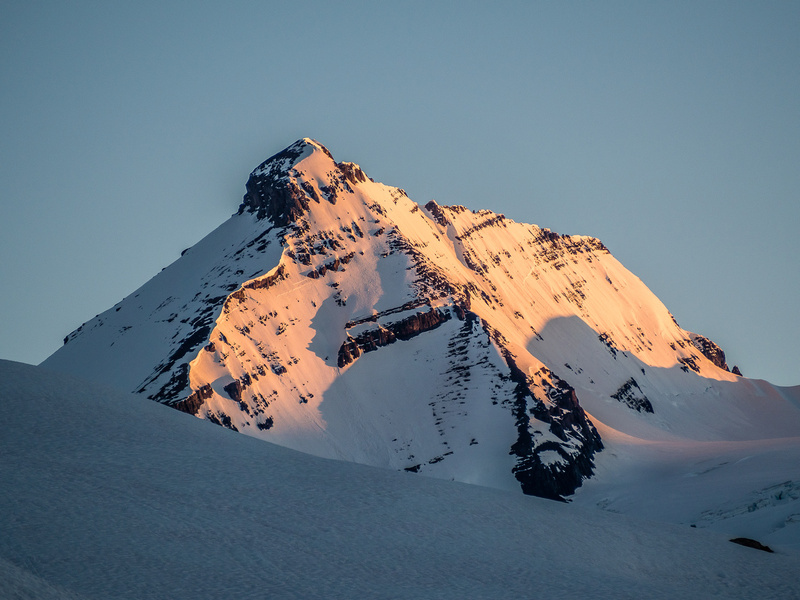 At around 05:50 the entire east face of Mount King Edward is lit up with warm morning sunshine. Once again we were faced with Alders on the road. The water is almost waist deep at 09:00 already and much faster than on ascent as Mike nears shoreline. Driving across the Bush River inlet to Kinbasket Lake on the first section of the Sullivan River FSR. It's corners like this (there's many of them) that make you want a radio. The Sullivan River FSR gets pretty narrow near it's end. Back near the Bush River FSR, looking at the Bush River running into Kinbasket Lake on the left.